Check out how you can use Kiwi Syslog Server to customize and filter virtual displays for viewing syslog messages. 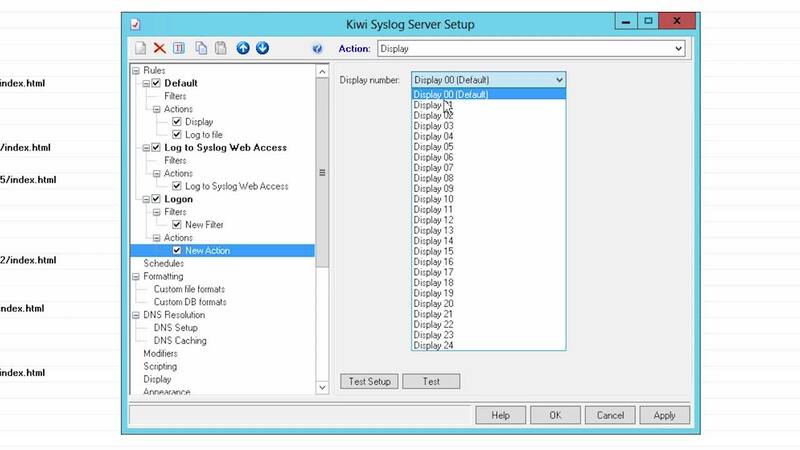 Kiwi Syslog Server provides up to 20 virtual displays for customized syslog monitoring. Kiwi Syslog Server allows you to customize and filter virtual displays for viewing syslog messages. Kiwi Syslog Server can filter messages based on Priority, IP Address, Hostname, Message Text, Time of Day, Flags/Counters and Input Source. Let's create a rule to filter logs containing the message text "logon." Now, let's add an action to display the messages based on the filter created. From the pull-down menu Action, select 'Display', and choose the display number you want to customize for this rule. Select the virtual display and you will only see the messages containing "Logon." Let's add one more rule to filter messages containing the word "Logoff" to another display. Now, when you select this display, you will only see the messages with the word "Logoff." Kiwi Syslog Server allows you to customize the names of displays by selecting the Display option in in Setup menu. Select the display name you want, and update the name.